Progressive Web Apps are new age mobile apps designed mimic complete online store with the above-mentioned features. Users can access the online store through their phone from any browser. What is the need of PWA’s? PWA is the answer to the long-standing problem of online store owners. In a competitive market, mandating the user to download a bulky app onto his mobile phone is quite a drag. The user can decide to uninstall the app at any point of time for reasons like space crunch. PWA allows the user to access the same online store features via his mobile phone, without the need of any apps. Users can just save a shortcut of the app and voila, they have an app on their phone. A PWA app can be accessed offline if the user chooses to. For an online store admin, this translates to better control of customer experience. It is possible to push notifications without asking the user to install bulky apps. In the USA, 19% of e-commerce sales happen through the mobile and it is set to grow to 27% in the matter of a few months. PWA enables a distraction-free product selection option for your users. They just need to tap on the product details, and they are presented with multiple inner sections like “Description”, “Product Ratings”, “Reviews” and “Sharing”. Your customers can have a robust and flexible shopping experience. They can just shop and checkout with minimum steps. The app can display content such as items/products, coupon codes, other cart bits and pieces under one section. Why is responsive and native web apps not enough? Native web apps worked well when the apps on any given phone were less. Back then, time spent of each app has drastically come down, particularly for the online store apps. With a surge in smartphone computing power and heavy adoption of apps, this time dropped drastically. In such a market, forcing a user to download a large app to shop is a deterrent. Before PWAs, online retailers had little or no choice but to create a bulky app or to create a mobile online store that looked like a website crammed into a mobile screen. While some online were successful in creating mobile-centric online stores, they missed out on marketing opportunities like notifications and push messages. In addition to being bulky, native apps were expensive to build and maintain. Regular security patches are a must to keep them up to date. Their reach too was limited to their bulk. Additionally, native apps had to go through the tedious process of approval by app stores. Below is the comparison of PWA, native and hybrid apps. Why PWAs are worth it? In a market where apps are fighting bloody wars for user eyeballs, imagine having your app comfortably placed on the mobile home screen. Additionally, it will never come to the user deleting the app to save space. Recent, developments in Safari and Microsoft indicates that these apps are accessible on all Apple phones and Microsoft platform 10 supported phones. In the first 6 months of 2018, 62% of smartphone users have made a purchase online using their mobile device. Google introduced PWA in 2015 and since, online retailers who adopted PWA witnessed 50% increase in conversion rates with SEO boost. Below are just some of the benefits. Instant page loads: The PWA have a powerful caching system technology that caches texts, imagery, stylesheets, and other UI/UX elements to provide app-like functionality in bad or no internet connection situations. Installed in a snap: The users can just tap the install button and it gets installed like any other app. No more prompts like “please wait”, “download running” and “app being installed”. Instant updates: Any website updates reflect your users right away. They need not wait for you to approve them for updating the app. Independent of Play Store and App Store: Your users need not install the app from Google Play or Apple store. You- as a Magento Store owner need not depend on these platforms. You are not bound by the strict guidelines of these stores. 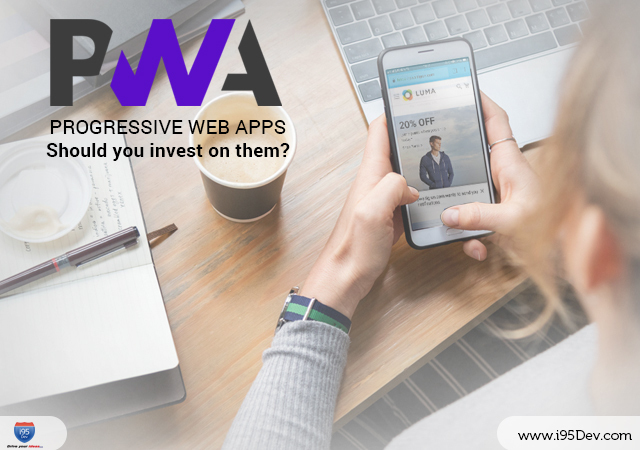 Indexing Included: Indexing of Google Progressive Web Apps is as fast as regular websites. You need not worry about deep linking of your app to appear in Google’s search results. Install anywhere: Your users can use the same progressive application on any device they carry (Android, iOS or Windows). Increases usability: PWA is lightning fast, user-friendly and easy to access. Inclined conversion: With its super speed and performance, search engines reward your PWA on top. Inside the Homepage: Your customers have an option of creating a shortcut to save on their homepage. They can check the app in high definition full-screen mode. i95Dev over the past few years, helped clients build Progressive Web Apps for e-commerce stores in Magento. Our core Magento team is involved in supporting internal multinational Magento stores making industry-specific best practices. For more information on how we can help you adopt PWAs, contact us on info@i95dev.com.